Lets just jump right in here, I am in India and I cannot even begin to describe how lovely it is here. I have never met kinder people in all my life. There is a sense of peace and contentment among the people that a naive eye would call laziness. It is far from laziness, if anything it is an understanding of what is most important: human relationships. Last night I sat out on our front porch with 3 women who do not speak my language. We smiled at each other, I held one of their babies and we just sat and enjoyed spending time together, it was just amazing. Indian people understand what it means to work hard, Indian people understand what it means to have good conversations but above all Indian people understand what it means to just be where they are and I think this just may be the most important thing I take away form all this. I have not felt rushed from a single person since I've been here. They treat everything like there is all the time in the world and I love it. Everything, everything here is amazingly beautiful in its own sense. As of Wednesday "Visit the Taj Mahal" has a little check next to it on my bucket list. To those people who say its a tourist trap: you are wrong, it is the most beautiful building I've seen to date. To those who have no reason to go to India but to see it: go. I honestly believe it would be worth a weekend trip just to see it but I sincerely hope you stay longer if you do come. We took a cab from Delhi to Agra (3 ish hours) and that in and of itself was an experience. Car lanes are extremely relative in India and everywhere you go there are huge trucks that have "Please Honk Please" written on their bumpers because they don't have rear view mirrors. Driving on the wrong side of the road, even on the freeway, is completely normal and will only result in a little honking. There are monkeys lining the side of the road and cows everywhere, I cannot even begin to explain how many cows I've seen here. And then there are the people, the freeways filled with pedestrians crossing at will. It was a bit of a shock at first but you get used to it. A cute little tour guide was provided for us by our taxi company and he showed us around the Taj and insisted on posing us for every picture we took, not kidding. There's no way I could ever try to describe the Taj Mahal so just keep scrolling. 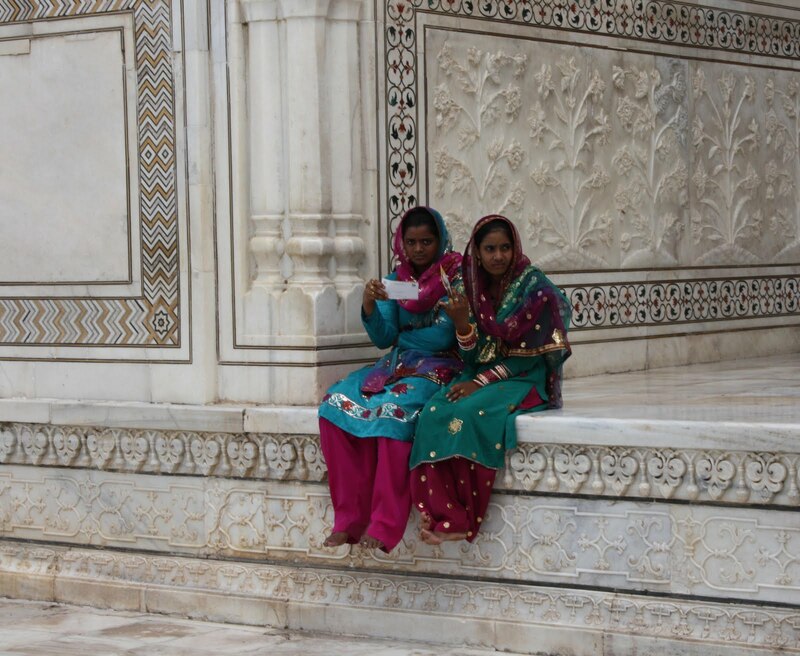 I will however tell you that every piece of color you see on the Taj is hand carved stone inlaid in marble, not paint. Every single little piece is carved individually and to give you an idea of the time table just one small flower takes several days to complete, to create a small plate, using the marble in lay techniques used on the Taj Mahal it takes roughly two to three months. After the colored pieces are formed the white marble then has to be gauged out so that the colored bits can be glued in with resin and that process alone is incredibly difficult, I tried just for a few minutes to carve away at a piece of marble in a demonstration shop and came away with bruised fingers. You don't have to understand how difficult the process is to see the beauty of it all but it certainly adds to it. The black writing you see is the Koran and that alone was breath taking. The Taj took 22 years to build and 20,000 men. And how can we forget that its the world's greatest love monument. Which is darling. I love it here, I am now safely in Visakhapatnam and everything is green and beautiful. More to come soon. This sounds silly but if anyone has any questions about India, the people, the culture, the homes, the streets, the slums, anything. Let me know. Don't promise such a silly thing. This is your blog, write as much as you feel like. Also, your pictures are incredible, you look beautiful, and you have convinced me to add India and the Taj Mahal to my bucket list.